Just before the Thanksgiving holiday I received notice from the Boston Athletic Association that my qualifying time for the 2010 Boston Marathon had been verified and I was officially one of the 25,000 participants registered for the 114th running of the Boston. Me. The Boston. There have been exactly two moments where the fact that I will be running in this year’s Boston Marathon seemed very real to me. The first was over the last tenth of a mile at the Pittsburgh Marathon when I could see the finishing clock above the shoot ticking 3:17:03, 3:17:04, 3:17:05 and I knew I had made my qualifying time – and the other was opening my notice from the Boston Athletic Association. So what makes this particular race so special? To me it is a mixture of prestige, history, the elite status of the race and the famous course from Hopkinton to Boston. If you are a runner anywhere, on any continent, you want to run Boston. At hundreds of marathons throughout the world the measure of success for millions of runners is the Boston qualifying time. As the only marathon outside of the Olympics that requires a qualifying standard, it is the measuring stick for the running world. For many, Boston defines marathon. In fact it attracts more media coverage from around the world than any other single day athletic event except the Super Bowl. The Boston Marathon has been held every year since 1897 on Patriots Day in celebration of the Revolutionary War battles at Lexington and Concord. Traditionally held on April 19th until 1969 – the race is now held on the third Monday in April which is the official Patriot’s Day Celebration in Boston where schools are closed, businesses close and the Sox play the Yankees at Fenway. Ironically in the case of this year’s running – the race falls on April 19th. The course has been relatively unchanged over the years with the exception of 1908 when the official Olympic Marathon distance was increased from 24.8 miles which according to famous Greek legend, in which the Greek foot-soldier Pheidippides was sent from the plains of Marathon to Athens with the news of the astounding victory over a superior Persian army to today’s 26.2 mile Marathon Distance. For you history buffs, the marathon distance was changed as a result of the 1908 Olympic Games in London. That year, King Edward VII and Queen Alexandria wanted the marathon race to begin at Windsor Castle outside the city so that the Royal family could view the start. The distance between the castle and the Olympic Stadium in London proved to be 26 miles. Organizers added extra yards to the finish around a track, 385 to be exact, so the runners would finish in front of the king and queen’s royal box. Every Olympic marathon run since the 1908 Games has been a distance of 26 miles, 385 yards. I would be lying if I told you this bit of history had not occurred to me at the 24.5 mile mark in each of the marathons I have completed. The point to point course from Hopkinton, MA to Copley Square in downtown Boston is among the most challenging found anywhere. It is both revered and feared for it’s beauty but also it’s hills. Runners will talk about the series of hills that begin at mile 16 in Newton and culminate in the famed “heartbreak hill” at mile 21. It is not only the elevation to be feared by even the most dedicated runners, but the timing of where “heartbreak” falls during the race. At mile 20 even the best conditioned athletes begin to run out of fuel – this described as “hitting the wall” is when your Glycogen stores are depleted and your body begins to burn fat as it’s source of fuel. Fat is burned at a much less efficient rate than your Glycogen stores results in the feeling that your body is giving up. For me this sensation in the past has lasted about 6-7 minutes or slightly less than 1 full mile until my body adjusts and I begin to push through. Adding a hill at this point in the race is akin to adding insult to injury. Another challenge to be aware of is the start of the race in Hopkinton features a fairly significant decrease in elevation over the first 2+ miles of the race. What seems to the casual runner to be a benefit once again comes to bear in the latter portions of the race. Racing over a decline places stress and strain on your larger leg muscles (Quad, Hamstring, Calf) that you typically do not experience over flat terrain. These leg muscles that you will be relying on heavily at the end of the race have been stressed early on. And for many runners, this becomes their undoing at mile 21 at Heartbreak. The key is incorporating hill training into your 18-week marathon training program to build those large leg muscles and condition them not only for the “ups” but also the “downs” at the start of the race. One part of the race that I cannot wait to experience is the famed “scream tunnel” approaching mile 13. So loud runners claim to be able to hear it more than one mile away. Classes are cancelled for the day at Wellesley where hundreds of students line the marathon course to give out encouragement, oranges, water, high-fives and of course kisses …..
One thing that is amazing over the course of a marathon are the individual moments that you remember, a runner with a funny outfit, a crazy sign held by a spectator or encouragement shouted just for you commenting on your name, your bib number, your shoes, or your running shirt. Last year at Pittsburgh I got a compliment on my legs which at mile 22 made me crack a much-needed smile and carried on my way for another half-mile down the course. One source of inspiration that I will be searching for at Boston will be the Marathon Man statue. Found near the beginning of Heartbreak Hill there is a statue of two smiling runners joining hands in a triumphant gesture. Both of the men in the statue are John A. Kelley, a world-famous long distance runner who ran in 61 Boston Marathons before his death in 2004 at age 97. The figure on your left, as you face the statue, is of Johnny Kelley at age 27. The one on your right depicts him when he ran his last full Marathon at 84. He won the Boston Marathon in 1935 and 1946, and represented the U.S. at the Summer Olympics in 1936 and 1948. April 19, 2010 – I along with 25,000 others will be taking on the course, the weather, the hills and participating in a bit of history all at the same time. Every one of us will have their own story to tell after the race. I for one am simply honored to be a part of it and plan on enjoying every bit of the 26 mile 385 yard journey. Over the past 5 years as I have gone from couch to Marathoner I have had the great pleasure of meeting a lot of great people along the way. In my very first organized race back in 2006 I met a 12-year old runner who had already raced more than 20 times. He was shocked to learn this was my first race and couldn’t believe I would be taking on the Philadelphia Marathon a few months later. I’m both proud and a little ashamed that I had to work very hard to take him down over the final .50 miles of that race – but down he went! At the Philadelphia Marathon I ran the final 2 miles with a United States Air Force Clergyman as we completed our first marathon together, struggling through the final miles. During the Pittsburgh race I ran with a young man from Chicago who was trying to qualify for Boston. He was 10 years younger than me and had to reach a goal of 3:10:00 to qualify for this year’s Boston Marathon. At mile 22 he began to slip off of the pace we were running and realized he was going to fall short. He stayed with me up through mile 24 and sent me on ahead to make my qualifying time at 3:17:43. Obviously disappointed he was truly happy for me as we parted ways and made sure to look for me at the finish. That is the thing I like most about this sport is that at the starting line there may be 5,000 or 10,000 runners – this spring in Boston I will be one of 25,000 and although there will be just one male and one female “official winner”, all of the participants and their family and friends are winners at the end. Setting a goal, being brave enough to chase it down and giving your best effort is really what it is all about, and for me, I have been fortunate to meet amazing people along the way. Danica and I met soley through the magic which is social media. Living out on the West Coast in Southern California while I am in Central Texas in Austin the chances of our paths crossing were quite remote. We began following each other through Twitter and I realized that she and I had very much in common. You can read Danica’s story here http://chicrunner.com/about/ where she talks about her passion for running, the challenge that cancer brought to her life and how she embraces the spirit of “live what you love” – which to me cannot possibly be put more powerfully or succintly. Her zest for life, passion for her friends and her spirit is something that you will really have to experience yourself as I cannot do it justice in this space. I will say however that anyone that will take on the 26.2 mile distance in a pink tutu is someone that I frankly want to meet! Please stop by her site if you have time for some great motivation and a few laughs – she is absolutely the greatest and I am proud to call her an amazing friend. With 142 days and a little over 700 training miles to go before toeing the line in Hopkinton, MA on April 19th I could not be more excited. Each training mile, each trip that I take traveling for my job, each person that I get the priveledge to talk to about our good friend Dom and his cancer battle is another opportunity for a new experience. I am fortunate enough to do something that I love doing and try very hard to follow Danica’s lead to live what I love. I can’t promise that I am going to be racing in any pink tutus this spring – but I can promise you this. When we finish at Boston and then come through the chute at Pittsburgh 13 days later they will most definitely know we were there. Thank you Danica for all of the encouragement and inspiration! Instead of a traditional weekday 10K run this morning I was up and off to my appointment with Dr. Jim Fernandez at Austin Sports Medicine. Most distance runners will tell you that there are two kinds of runners. Those who have suffered an injury and those who have not suffered an injury yet. Given the complexity of the human anatomy, all of the various small muscles, joints and bones that are placed under stress when we exercise – no matter how many precautions are taken, injuries do occur. The key is to really stay in tune with your body and make sure that you are paying close attention to warning signs. There is a very large difference between “pain” and “injury” – recognizing when something just doesn’t feel “right” is something that most runners understand. The key is to not try to be a hero, train through the injury and making it worse. Enter Dr. Fernandez. As this calf injury had lingered on I was beginning to wonder if there was something more serious going on – what would typically not raise many concerns for me as the R.I.C.E. method and a couple of days off has always proven to knock out such small strains and sprains in the past (Rest, Ice, Compression, Elevation) – this one seemed to be hanging on a bit too long. After my flight to Los Angeles on Monday of this week the pain seemed to move from my calf area to the front right area above my ankle. With Boston training set to go full bore beginning December 14th – it was time to get this checked out. Dr. Fernandez was of great help today in not only removing some of my greatest fears, (stress reaction, stress fracture, musculature issues), but he was able to give me great assurance that after a few more days off and anti-inflamatories we would be back out there getting ready to compete in April at Boston and May at Pittsburgh. Welcome to Team Dom Dr. F! Another person added to a long list of supporters that are there to help the Run for Dom effort. The human mind is truly an amazing thing – just getting positive reassurance from Dr. Fernandez as well as some stretching exercises to help alleviate the pain in that area my calf and lower leg already is starting to feel better. I am going to take this time to spend some down-time with family and friends over the holiday weekend, take advantage of some time off from work and get back after it next week. Thanks everyone for all of the positive encouragement and well wishes – just a bump in the road in the life of a marathoner. If it were easy, everyone would do it. It is amazing to me sometimes the symmetry that life throws at us. It seems at times that we are all just spinning around on this rock, moving from place to place, event to event. Each choice we make can seem random and arbitrary, but when you take a step back and really look at things from a slightly higher plane or perspective – there really does seem to be a method to the madness. This past week once again my good friend Dom has taught me a valuable lesson – this time it is about the virtue of patience. Since his surgery approximately 3 weeks ago as of this writing I know that there is nothing more in the world that Dom would like to be doing than going home to spend the family with his wife Val, his daughter Sierra and son Nico. Dom’s surgery which was very successful and has since shown no signs of complication has led to a slower than hoped for recovery period. There is a great update on Dom’s caring bridge journal from his cousin Renee below that talks about the challenges so far and what is causing the delay for Dom being home for the Holiday. At the same time, his close friend and Marathoner – me – is struggling with a frustrating calf strain that has reared its head at a very inopportune time. What started as a nagging irritation is now something that I have had to shut down from running this week and will be consulting with Dr. Fernandez tomorrow morning at Austin Sports Medicine. Only three weeks away from the start to my 18-week training program for the Boston Marathon, I am very frustrated and disappointed. All of the hard training this summer to build lean muscle, strengthen arms, legs, chest, back, core are now taking a backseat to rest and rehabilitation. Mile splits which I have been able to reduce from a 7:31 marathon pace down below 7:00 are now going to need to be rebuilt after this bout of soreness. As I was feeling particularly sorry for myself – I was able to take a step back on my flight home from L.A. today and put it all in perspective. I need to take a lesson from my friend Dom – This step back in recovery that Dom is experiencing makes my disappointment in the interruption to my training all but insignificant. All of Dom’s friends and family are connected this Holiday season giving thanks for precisely the same thing. Whether we refer to Dom as our friend, husband, Dad, son, brother, uncle, cousin, grandson, nephew, co-worker or neighbor – we are all so very thankful that he is in our lives and is fighting like no other against this terrible disease. When this issue I’m having is cleared up at the hands of Dr. Fernandez – and I have little doubt that it will be – we are going to get back out there and hit those streets and trails with great confidence and great effort to show up to Hopkinton, MA on the morning of April 19th singularly focused on making my good friend proud. Proud of all of you who have been following this journey, proud of all of the supporters who have given to the Run for Dom campaign and other fundraising initiatives and proud that through adversity we are all sticking together as that is what it is all about. John Bingham wrote about marathoning that it takes far more courage to start the race than to finish it. I would say that I have to agree. I know one thing for certain with the Thanksgiving Holiday approaching – I am glad that I have a great role model to look up to for inspiration as I rest, rehabilitate and then train up for Boston – I know Dom is no quitter and I am certainly not about to let him down. Thank you Dom. Happy Thanksgiving everyone. As I have mentioned previously when I began training in earnest for my first marathon in 2006 the only thing that I knew about the sport is that I knew nothing at all. 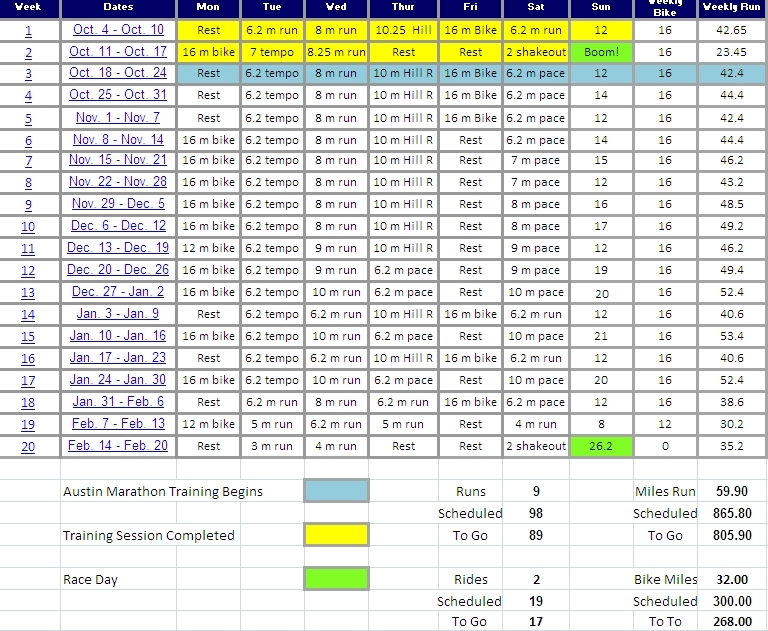 I read everything that I came across and consulted with any expert I could find to determine how to build my weekly mileage and get ready for the 18-week training program that would get me through the 26 mile 385 yard distance. I was very dilligent in my training, paid close attention to the mileage on my shoes, ate right and sure enough on November 19, 2006 I covered the distance and could look in the mirror and say the words that every first timer can’t wait to say, “I am a marathoner”. It was not too long after the Philadelphia Marathon was over before I started to think about another challenge. Would it be possible at the age of 40 for me to dramatically decrease my time from a 3:58:08 first time showing in Philadelphia to under 3:20:00 to qualify for the Boston Marathon? That meant decreasing my marathon mile pace from 9:05 per mile to 7:38. Your running pace is not a very complicated mathematical equation – simply it is your stride length X the frequency of your stride. If I was going to seriously make a run at Boston there were only a few variables that I could really attack with a training program. Because I could not choose my genetic make-up and there was not much I could do to elongate my 5′ 8″ frame to lengthen my stride – it was going to come down to increased strength, increased flexibility and training to run fast. Strength training for runners is now widely accepted as a key to success. That was not always the case however and has taken quite a bit of time to debunk many of the myths surrounding the practice. Runners would say that they did not want to strength train because it would add weight by way of increased muscle mass and they did not want to carry the “extra” pounds over the 5K, 10K, 13.1 mile or 26.2 mile distance. Other factors were simply the belief that the only way to become a stronger runner was to run more. Time spent in the gym was time that could not be spent out running – so strength training took a back seat to more miles. I will say this – without incorporating strength training into my training program it is an impossibility that I would have been able to qualify for the Boston Marathon. Did I increase the frequency of my running as I began training for the 2009 Pittsburgh Marathon in an effort to post a new PR (Personal Record) and BQ (Boston Qualifier) – absolutely. I ran more miles and ran them at a much faster pace to hit my time of 3:17:43 (7:31 pace). But it was the strength training sessions 3X per week that allowed me to increase both the frequency and intensity of my workouts. My personal trainer Kerensa (do not let the photo fool you – she is not nearly as nice as she looks!) can be credited with a great deal of the success in trimming more than 40 minutes off of my marathon PR. Kerensa developed a training program that took into account my desire to increase lean muscle mass while building upper and lower body strength. She also made it a priority to strengthen my core and that truly has made all the difference. Your core is essential to improving your running efficiency. Strengthening your core as well as your other large muscle groups – Quads, Chest, Arms, Back inceases your overall strength – but it does more than simply give you more power. When muscles do not need to work as hard, they do not require as much oxygen or as much circulated blood. This puts less demand on the heart and reduces the rate at which it beats. This leads to a significant improvement in endurance. The buzz-word nowadays for runners is “functional strength”. Something that Kerensa has done a great job with in designing a training program that improves my overall strength and stability. Remember that when you run your leg and opposite arm are working in unison. Left leg forward – right arm back, right leg forward – left arm back. At the center of this is your core which if strong and well maintained will be able to keep your posture erect, take weight and pressure from your spine and lower back, rotate your hips and be able to do so mile after mile – making you a much stronger more efficient runner regardless of distance. Each time that your muscles contract oxygen and nutrients in your blood are required. Just as your legs require this “fuel” your arms also draw upon the heart to deliver oxygen and nutriengs as well as remove lactate (waste) so that they can continue to move with ease. Again, it is all about the stride length and stride frequency to propel your body over distance. The easier your body has to work to do so will enable you to cover that distance more efficiently and to do so for a longer period of time. For me I strength train 3X per week on Mondays, Wednesdays and Fridays. Since Mondays and Fridays are my rest days from running – it is only on Wednesdays where I pull “double-duty” and combine my strength training with running on the same day. After a warm-up, which is key to not exercising a cold body part and risk injury (10 min. on a stationary bike or maybe a quick 5 minute jog on the treadmill) I will do 20 minutes dedicated to strengthening my core. Kerensa has developed quite a few core exercises for me to keep them from becoming stale, and let’s be honest – 3 sets of 15 Leg raises to 90 degrees with a 10 lb. dumbell in betwen my feet is not necessarily “fun” at 6:30 a.m. – but it does work and I can honestly feel my core helping my stability and strength over my long training runs. Cruches, V-Ups, side Abdominal stretches all are part of building and sustaining a strong core area and it is the part of my strength training sessions that now I actually look forward to – starting out when those areas were in need of a lot of attention, these were the most difficult of exercises for me. In 4-6 weeks I could feel a tremendous difference – which from a training perspective is a very short period of time. After this period, Kerensa will take me through a 30 minute workout with very little break moving from exercise to exercise and body part to body part. In less than 1 hour from the time I walk into the gym to the time I leave – each key muscle group has been addressed. Those three hours a week have made all the difference and I know will pay great dividends not only at Boston this year but certainly 13 days later at the Pittsburgh Marathon which I know will be more about the work I put into preparing for those two races than the effort on that particular day. Today is my final day of travel this week as I head back home to Dawn and Kayla in Austin. Waking up in Columbia, SC – my old college town – I was excited for some great hill training this morning. On visits to the University of South Carolina I have a great route that takes me from my hotel on Hampton street up to the South Carolina State House and then down a long hill over the Gervais Street Bridge onto the Congaree River Trail. An absolutely beautiful run about 10K in distance with a 3/4 mile long climb back up to the State House at the end of the run. Although the humidity can sometimes be a challenge here in Columbia, I always look forward to this run while I am here. The morning run today started with a mist hanging over the city streets, remnants from last night’s rain. Cool temperatures right around 60 degrees and off we went toward the state house, which in the pre-dawn morning is really beautiful – the grounds are tremendous, beautifully landscaped with some amazing memorials and sculptures. As I covered the distance over the Gervais street bridge was looking forward to running along the river as the Congaree River Trail winds through a heavy canopy of tall trees teeming with wildlife only 1.5 miles from downtown Columbia. As I made my way along the path that leads to the trail system I thought to myself, “Huh” – never noticed that gate before, I wonder why it is shut this time of the morning. Much to my dismay not only was the freshly installed gate shut – it was in fact chained and locked. Who locks a nature trail and more importantly who has the audacity to believe they are the person on the planet entitled to having a key to it? Hard to comprehend at 6:15 am for sure. Turned out to be quite a blessing in disguise. I quickly turned around and headed directly back up the hill to the State house. What is usually the leg burning, lung challenging end to my run became the middle portion today and as I crested the hill at Gervais and Main I still had 2.5 miles to go. It seemed that a campus tour was in order. I was able to cover most of the main campus at the University of South Carolina while it lay largely asleep this morning – and was able to see it in a way that I never did while a student on campus. (Mostly due to the fact that I was never awake quite that early) The Longstreet Theater at the corner of Sumter and Green Streets rose up in front of me bringing back memories of lectures I attended over two decades ago. I ran past the Thomas Cooper Library where as a first year student it took me a better part of a semester to fully embrace the fact that several floors of the building were below ground so that your elevator to the “upper floors” would actually take you down and vice-versa. I ran past Henderson Street where I lived during my final year at Carolina with a close friend who would later stand up for me at my wedding as I would for him just a few years later. I was able to pass the Russel House and on to the famed “Horseshoe” to reminisce about afternoons daydreaming under tall Oak trees wondering what I would be doing 5, 10, 15 years later. What began as a disappointing start to my weekday training run turned into a great experience today – that is one of the things that I still really enjoy about distance running. Looking back at my 2009 training log this morning today was run number 229 so far this year – every one of them unique with their own rythym and pace. Today’s run covered about 10 Kilometers at 7:11 pace, solid given the hill work. What made today’s run unique was that it also covered a little more than 20 years in just over 6 miles. Wrightsville Beach, NC – You know those mornings where the alarm clock goes off and you can’t wait to jump out of bed and take on the day? All right, I don’t really feel like that very often either, but this morning, Tuesday, November 17, was one of those days. I felt that way because I was off to run at one of my absolute favorite locations – The Loop at Wrightsville Beach, NC. Being an early morning runner I have a special place in my heart for the east coast when it comes to running locations – there is something about starting out before daybreak and seeing the sun come up over the horizon. The day is new and no matter what has happened over the past 24 hours – you get a sense that today is going to be better. It also feels like the things that you take in at that hour of the day were placed there only for you to see. Whether it was the gulls I flushed into the air along mile two of my run, the newspaper man who gave me my first good morning of the day or Bailey the chocolate lab who tried to join me around mile 5 all of these experiences were mine and mine alone. I feel pretty confident that not very many distance runners from Austin, TX can say they almost trampled on a blue crab crossing over a causeway this morning – (efforts to find said crab and publish via the web this morning were fruitless after my run). Today’s workout was a standard mid-week training run – 6.25 miles at a quick 6:54 pace – no hills, no tempo work, no PR was set – but one thing I learned during my training last year at this time ramping up to make a run at a Boston Qualifying time is that no individual workout is “the key” to your training success. It is a culmination of all of your workouts, each mile that you log building upon the last that put you in a position to reach your goals. For me it was this bit of realization that made it all come together and help me achieve my Boston time. Logic dictates that if no individual workout, no matter how well executed, can make or break your performance come race day – then each and every individual mile is in and of themselves “special”. Each workout, whether it is the last of three 20-mile training runs later this winter leading up to Boston or this morning’s 6.25 miles around Wrightsville beach (twice) is a critical part of the process. So enjoy them all I say. Enjoy equally the rainy mornings that test your commitment and the windy days that make your legs stronger. Enjoy the hot days that test your willingness to tough out a difficult run and the blue crabs who cross your path. Enjoy the hills both up and down and most importantly – work in a few sunrises along the way. They can make all the difference in the world.